After our sojourn in Tokyo, we proceeded to run along the length of Honshu (the Japanese mainland) again, this time with Shawn in tow. We were excited to revisit our favourite places and see some new ones along the way. We weren’t so excited that we were willing to get out of bed early, though — we left our hostel in Tokyo around noon. We caught the bullet train to Kyoto, where we settled in at the same hostel we’d stayed in previously. In fact, we’d kept the same rooms rented while we were away in Tokyo and left our luggage there; in a way, the Kyoto hostel was our home-away-from-home-away-from-home. 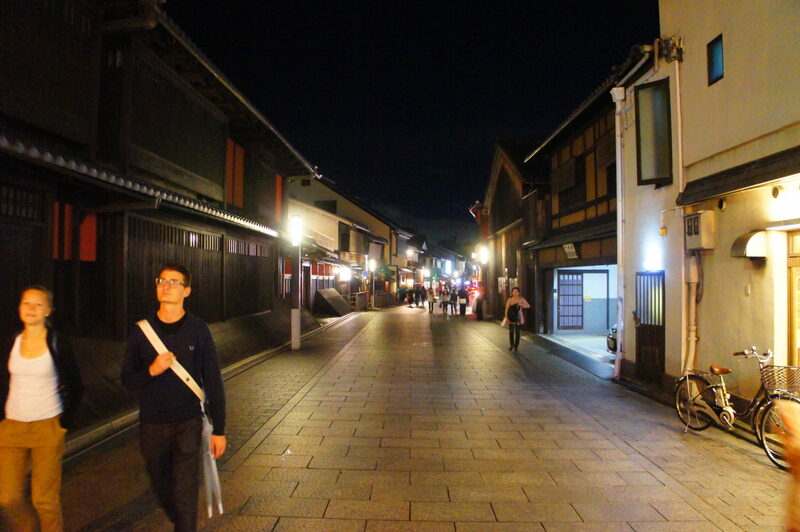 We ate a quick dinner near our hostel and headed off to the Gion district of Kyoto. The Gion district is a historical preservation site, where modern towers and asphalt streets give way to wooden shops and stone walkways. It’s also a “Beautification Enforcement Area”, where littering is subject to a fine of ¥30,000 “regardless of your nationality or status” (or so the signs warned us). We were careful not to drop anything. Lit using traditionally-generated electricity, I imagine. We were drawn to Gion by Gion Corner, a performing arts centre which showcases seven different styles of traditional Japanese art. It has the trappings of a theatre and the mission of a museum; field trips from local schools are common and informational materials about the arts on display are plentiful. It’s a magnet for tourists, which were also plentiful. The seven traditional arts shown at Gion Corner are: a tea ceremony, flower arrangement, a musical performance with a Japanese zither, court music, a slapstick comedy show, puppet theatre, and a dance by maiko. The maiko dance (called kyo-mai) is the headline event; maiko are apprentice geiko, which are a kind of entertainer (similar to geisha, though I am advised that there are several important differences). All seven events are shown on stage in rapid succession; the whole show takes less than an hour. The first event is the tea ceremony, which includes audience participation — two audience members are selected completely at random to be served tea. Once again, Kat was completely randomly selected, as she always is. A combination of aggressive arm-waving and brilliantly blonde hair seem to help tilt the odds in her favour time and time again. The tea ceremony’s… officiant (?) gets set up on stage. The ceremonial pouring of the ceremonial tea. Kat preparing to unceremoniously down the ceremonial tea. The other six arts were quite entertaining, but involved significantly less Kat. This did not dissuade her — rather than returning to her seat, she set up shop a few feet away from the stage and proceeded to generate a photographic record of the show. The lady on the right is playing a koto zither, and the lady on the left is arranging flowers. The lady in the back will carry the flower off-stage. An orchestra playing gagaku court music. This masked fellow danced during the gagaku performance. Two maiko perform a kyo-mai dance. Black-clad puppeteers performed in a traditional bunraku puppet play. This isn’t one of the seven arts, it’s just a nice tapestry on display. It has a sake brand’s logo on it. After the show, we exited through the gift shop, which we understand to be a traditional and essential part of Japanese theatre (something they have in common with the Canadian arts). 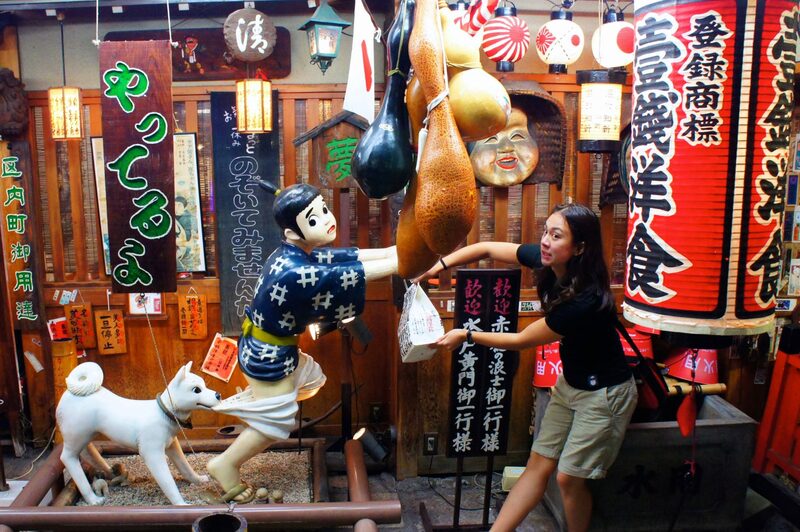 This is where we met Mayumaro — Kyoto’s official mascot! He is an adorable anthropomorphized silk worm cocoon with an adorable coat and adorable eyes. We were smitten. A sign welcoming us to the gift shop. Shawn was pleased make Mayumaro’s acquaintance. Amelia suddenly realized that she had a silk-worm-cocoon-shaped void in her life that only Mayumaro could fill. Mayumaro has many collectible pins which recognize the cultural offerings of Kyoto. From this point on, we began to see Mayumaro everywhere. He was always greeted with a squeal of delight. The larger area of Gion is very walkable, with many bridges and alleyways connecting its various shops, so we took an evening stroll through this picturesque region of Kyoto. Along the way, we encountered Issen Yoshoku, which (we later discovered) is one of the more famous restaurants in Kyoto. It certainly is eye-catching — the restaurant itself is full of mannequins and the walls are covered in lanterns, signs, wooden faces and all manner of outrageous items. Out front is an anatomically-correct statue of a boy trying (and failing) to outrun a dog with a bag of take-out. Although I do not count myself among the most observant of tourists, the concerted lack of subtlety quickly brought the storefront to my attention. The statue really is anatomically-correct. This camera angle was carefully selected. We vowed to return to Issen Yoshoku for dinner on another night. In the meantime, we wandered the streets of the Gion district. We found that the area was densely packed with narrow alleyways bursting with shops, inns, restaurants and the like. Gion is also the centre of geisha culture in Kyoto, and we saw several women who appeared to be geisha flitting silently across alleyways. On reflection, I suppose the alleyways weren’t really “narrow”. They’re about as wide as a typical sidewalk (or maybe even a little wider), there’s just no car-sized street to give the visual impression of space. They were well-lit and -populated, more like a city street than an alleyway. Plus, there are shops on both sides of the walkway, which is certainly an improvement from a pedestrian’s perspective. It’s hard to capture the feeling in photos, but it was actually quite an intimate-feeling environment to wander around it. We really liked it. Many bridges cross the Kamo river in Kyoto; we crossed one of them. Amelia and Shawn do their best Cactuar impression. An alleyway in Gion. Kat is included for scale. We wandered for most of the evening and eventually began to find our way back to the hostel. The Missus began to feel peckish along the way, so we stopped in at a place called MOS Burger. And man, am I glad that we did. MOS Burger was, hands down, the most revelatory part of our trip to Japan. MOS Burger singlehandedly justified all of the airfare and room fees encountered up to this point. MOS Burger is to cuisine as Koyasan is to tourism — the perfected distillation of the form, and the embodiment to which all others should aspire. 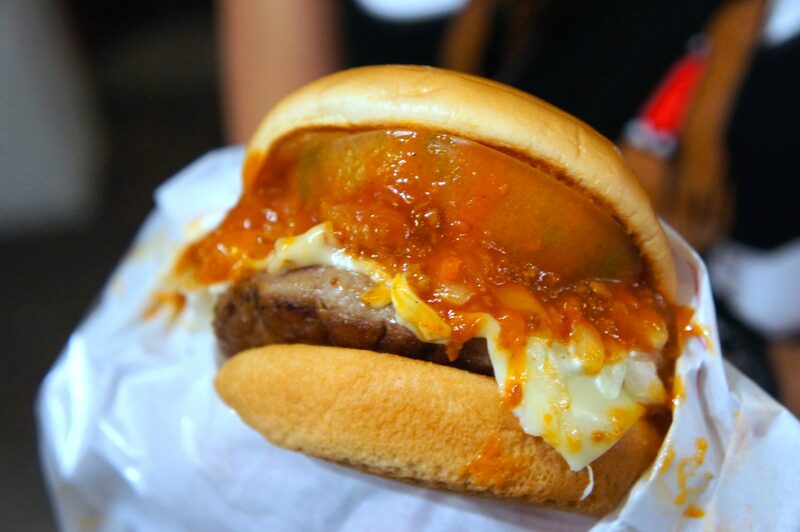 Why, yes, that is an egg, a tomato, sweet chilli, cheese and mayonnaise atop a succulent beef patty. It was $3. Having dined on a small sliver of heaven, we retired to our hotel. We awoke feeling refreshed in body and soul alike. We spent the next morning touring Yasaka shrine. This is, apparently, one of the oldest and best-known shrines in Kyoto, and is the centre of one of Japan’s biggest summer festivals. However, given that it was not yet summertime, the shrine was pretty quiet when we visited. The buildings of Yasaka shrine, seen through some trees on the shrine’s grounds. The primary site of the shrine itself is a small complex of buildings, including a main hall, a dance stage, and other structures with purposes unknown to us. Japanese shrines do not go half-way on their entry gates. Yasaka shrine’s rooftop game was on-point. The buildings were nestled into the trees so that you could almost forget they were there. The shrine was surrounded by carefully manicured grounds, complete with ponds, waterfalls, topiary, stepping stones and so on. We spent nearly two hours exploring the maze-like system of paths through the trees, over hills, and around buildings. We can’t get enough of little round shrubbery. The stone arches which serve as walkways over this pond were a nice touch. The greenery of the grounds was broken up by the first signs of fall. The shrine was a place of immaculate detail; every surface and alcove had its own character. Our cameras’ shutters got a real workout as we set out to document every nook and cranny. These flowers were on display in a sheltered area; they seem to rotate displays according to the season. An intricately-detailed floral surface on one of the shrine’s weathered gates. Another gate featured these detailed fasteners. After touring the shrine we stopped by a cafe for lunch. We were feeling like having something novel, so we stopped by a classy-looking spot in hope of munching on some fancy (and heretofore unmunched) Japanese cuisine. Unfortunately for us, the place we chose turned out to be a European-style cafe with exotic and fancy foods such as… sandwiches. And, this being Japan (and not, say, France), we paid a premium for the imported luxury. I think that there is a lesson to be drawn regarding the cues that we might read as denoting “classy” vs. a Japanese person’s perception of the same. But this is a breezy travelog, so there will be no such introspection here! In retrospect, the chairs should have been a red flag. I’m not sure what the Japanese name for this dish is. Amelia ordered this cheese bread concoction which (she reports) was actually quite good. 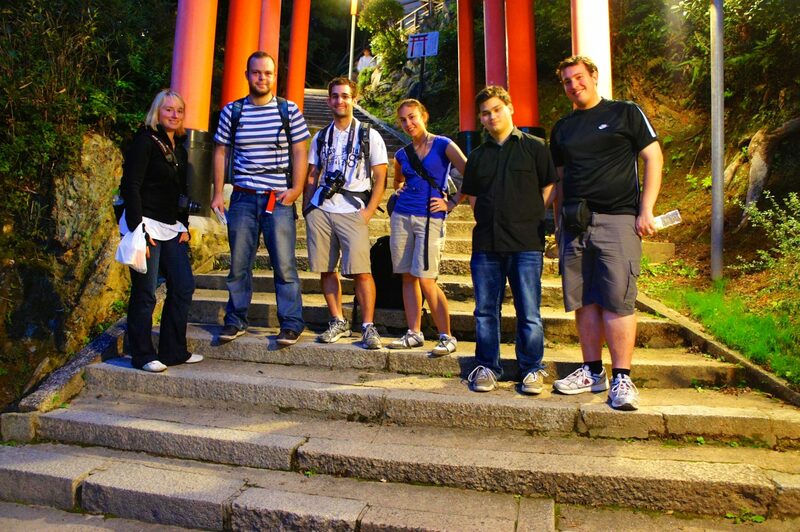 Following our feast on foreign fare, we made our way to another shrine — Fushimi Inari Taisha. This is the head shrine of Inari, the Shinto god of rice (and also, as it turns out, business). The main part of the shrine (go honden) is set into the base of a mountain, and the mountain itself has hiking trails connecting various smaller shrines to Inari. This is the main offering hall, located in the centre of the complex at the mountain’s base. Foxes are said to be Inari’s messengers, so there were fox statues everywhere. The key in the fox’s mouth is symbolic of prosperity (by way of representing a key to a rice granary). We couldn’t have asked for a nicer day for a mountain hike. 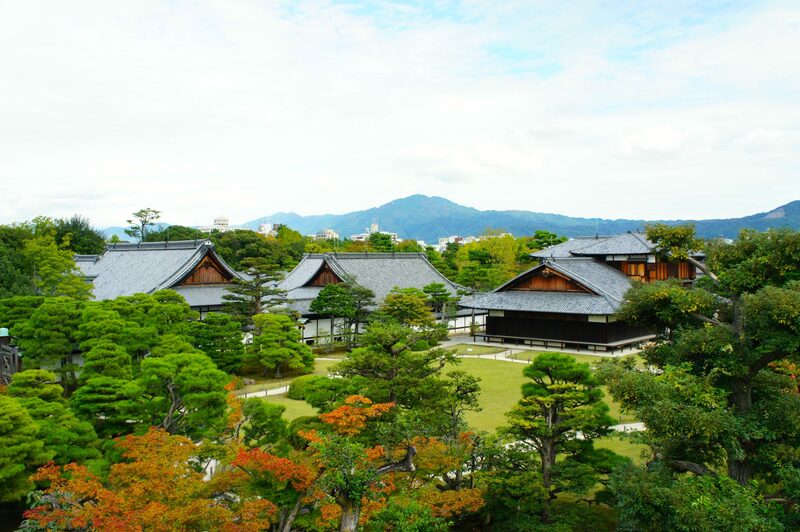 Behind the main shrine area are the mountain trails. We hiked our way towards the inner shrine, though it was the trails themselves that we had come for. The trails are called Senbon Torii, meaning “thousands of torii” (torii are those distinctive arched gates that we’ve seen throughout Japan). The trails live up to their name; they are densely packed with torii, with many kilometres of gates forming a sort of red-hued tunnel up the mountain. The first of many, many torii along the mountain trail. The torii are all donated; these big ones are all labelled with the names of their generous donors. We went down both of these paths just to be sure we weren’t missing anything. We have a ton of photos from inside Senbon Torii. I still use one of them for my phone’s lock screen. After a short hike we arrived at okumiya, the inner shrine. Children would make the hike and hang small fox-faced tokens here, presumably with prayers or wishes inscribed on them (though, not being able to read Japanese, this is merely an educated guess). The inner shrine is quieter and more rustic than its big-city brother at the base of the mountain. Like any good shrine, a ceremonial cleansing fountain was available. Numerous fox tokens hung from the walls. Further up the mountain are numerous smaller, private shrines (called tsuka). Worshippers hang tiny torii here (undoubtedly a much cheaper option than constructing a full-sized gate along the path), light candles, pull on prayer ropes and conduct other activities. One small cluster of private shrines, just off of the mountain trail. Mini-torii are stacked everywhere in the tsuka; on rails, behind offering plates, and on nearly very surface. This is one of my favourite cleansing fountains. It’s got character. Not every shrine has candles, but they do make an appearance. We made it to the summit and took a breather. Well, that might be over-stating our accomplishment; after two hours of hiking and diligent photo-snapping, we had made it to Yotsutsuji, a rest stop about half-way to the summit. Yotsutsuji is an intersection, where the path splits into one path going further up the mountain and another path offers a relatively direct route down to the city below. When we arrived at Yotsutsuji the daylight was still shining brightly. After lolling about for twenty minutes, dusk had fallen. Our choice of direction was made for us. Although, to be totally frank, our hamstrings would probably have thrown the deciding vote if the sun hadn’t done so. 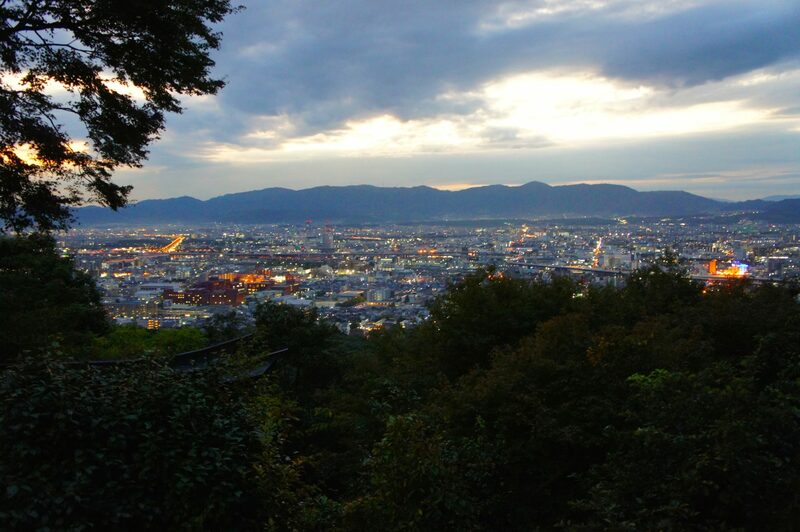 And besides, Kyoto looked so inviting! Just as we began the descent, we heard some familiar voices behind us. It turns out that Robbie (who you will remember from our travels on Lantau Island) and Patrick (another friend from Hong Kong) happened to be hiking the very same trail at the very same time! We took this as a sign of good fortune, and resolved to tackle the evening’s adventures together. Wait, am I wearing dress socks and runners? Man, no wonder I preferred to stay behind the camera. As it happens, the six of us were united by a single purpose and possessed of a common dream — conveyor belt sushi. Robbie happened to know a place, so we made haste towards this singular culinary marvel in downtown Kyoto. Look, I don’t judge your dreams, OK? Let me live. Our gastronomical pilot about to whisk us away on a culinary journey. There’s something delightful about grabbing two pieces of sushi at a time, as the whim strike you. I have a long-standing love affair with roe-based sushi. You pay by the plate at these establishments. It was a costly night, but worth it. We spent a long evening devouring sushi and sharing travel stories with our surprise companions. After paying off our tabs at the conveyor belt sushi place (also called kaiten-zushi), we resolved to head back to our respective hostels. Robbie and Patrick were soon to be departing Kyoto, and we expected to spend the next day touring the Kansai region, so we promised to meet up back in Hong Kong. With our bellies and cameras full after a long day’s touristing, we retired to our bunks and dreamed of temples yet unseen. 22 February 2015 11 February 2018 Christopher ScottComments are off for this post.